Roy Arthur Accola was born 04-13-1919 and grew up on a farm East of Greeley Colorado. He joined the Army 01-11, 1942. He later applied for admission to the AAF and was accepted. He did his Pre-flight School in Texas. He then went to the W&B Flight School in Chickasha, OK. He soled on 07-15, 1943. He then went to twin engine school in 1943 at the Enid Army Flying School in Enid, OK. He was commissioned a 2nd LT on 01-7, 1944. He was transferred from Salt Lake City, UT to Peterson Field in Colorado Springs, CO in Feb, 1944. 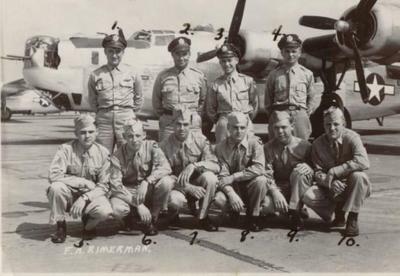 The crew was transferred to Topeka, KS on 05-06, 1944. 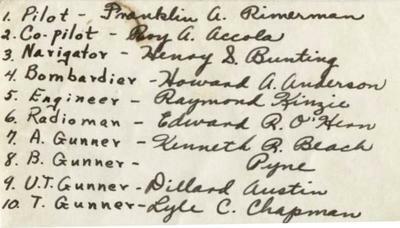 Franklin Rimmerman was the Pilot and Roy was Co-Pilot. There the crew picked up a new B-24J. They flew this plane to Bari, Italy on 05-17-1944. His crew became part of the 513th Bomb Squadron, 376th Bomb Group. According to Ed Clendenin's records, this was not the plane that the crew flew in their missions. The crew's 1st combat was on D-Day in the Normandy Invasion. On the crew's 31st Mission on 08-15-1944 at approximately 0300 Hrs, their plane crashed on take-off. On the Official Crash report, the cause of the crash was Pilot error. Thirty years later, by accident, my Aunt found out what appears to have really happened. An older loan officer in a banking institution saw her maiden name (Accola) on her and her husbands application for a house loan. As they kept talking, the crash incident came up. He paled and said, My God, I know about that. He then told how he was on the tribunal trial that heard the case of a 23 year professional Army Master Sgt. that was caught red handed tying hand grenades to the wheel gear while he was fueling the planes. Upon take-off, the wheels would retract and pull the pin on the grenade causing the plane to crash. He brought down several planes this way before being caught. The bank man said that the Sgt. was caught, tried, convicted and executed the same day. The Nazi's had got to him and was paying him money to bring down US planes. I can find no records to substantiate this story. An acquaintance that was stationed at that air base in Nevada that doesn't exit who has a very high clearance also did major research and can find no records. The man who told my Aunt this story said that it was not unusual in war time for the pentagon to keep these kinds of stories hushed up so as not to get the public upset at the war effort...by now with all of the years gone by, it looks like only GOD knows for sure. According to the crash report, their were 2 original members that were not on the plane when it went down. We know for sure that Howard Anderson was not in the crash. He actually came out to Colorado and visited with Roy's parents a few years later. If anyone has any info concerning this post, please let me know! Thank You!!! Thanks Ed for doing this site!!! About the end of August of 1944. My Mom, myself and little brother Larry were staying at my Grandparent's, Art 'Poom' & Lillian 'Granny' Dunn Accola's farm (Dad was in the Army so we stayed with them) when they got word of Roy's death about 2 weeks after the fact. I remember distinctly (I didn't fully understand the enormity of what had happened, I just didn't like all of that crying) the night the old town constable Harry Green brought out the telegram from the War Department at about 9:00 PM...."The Secretary Of War regrets to inform you"....Harry asked Granny if Art was around and she told him that he had gone to bed, but he could talk to him through a window in the bedroom which he did. Harry read them the telegram. I can remember my Mom bailed out of bed like a rocket when she heard my Gma cry out "Oh No"! She threw on her robe and ran out of the bedroom and Granny told her what happened. Then they told Aunt Jean. Larry was about 13 months old and he was crying because Mom scared us moving about so quickly as we had been asleep. In a while Mom came back in and sat down on the edge of the bed and gathered us up in her arms and just cried and cried. And so did we, not liking to see Momma cry. The next day, Poom just couldn't seem to get up, he was so full of grief. Granny was also grieving, but knew it was gonna be pretty busy doing what had to be done on the farm and notifying other family members and neighbors. She was so strong, but yet so tender hearted! She got Larry and took him into the bedroom and put him in the bed with Poom. Poom loved little babies and it was just a minute and he was loving and playing with Larry. He finally looked at Granny and said he guessed he better get up and get going. Late in the afternoon as usual, Granny and I would walk about a 1/4 mile out to the highway and get the mail. I don't know when this happened....if it was the next day after being notified of Roy's death or probably the day after that. Anyhow, the mailman would always put all of the letters inside the Greely Tribune newspaper and Granny would take the bundle out of the mailbox and place it under her arm and we'd head back to the house. When she'd get back, she'd go into the living room and sit on the piano bench next to a big window where the light was real good. She then normally would read any letters they got and then read the paper. But when she opened the paper up this time, there was a large picture of Roy on the front page. I was playing there on the floor beside her and I heard her quietly crying....I remember I jumped up on the bench beside her and put my hand on her leg and shook it and said, "Granny, please don't cry! "....she looked down at me with her eyes full of tears, smiled and put her arm around me, hugged me up real good and said, "It's OK honey, It's OK. And it was for me then, but not for her....it was a huge hurt for everyone. There was usually a 10 man crew on each B-24 when making bomb runs and there were about 8 planes brought down making it about 80 families that went through the same thing as our family did. The only difference is, they do not know the cause of the crash like we do. My father, Clark L. Baldon told me about the night he got the telegram about Roy. He was a Pfc. in the Army. I forget where he was stationed at. He said that after he read it he was so angry and upset that he could hardly stand it! He decided to take a walk and try to walk off some of his emotions. He was walking along with his head down, tears in his eyes and lost in thought. He walked right by a full bird colonel without saluting. A very loud and sharp voice brought him out of the fog he was in. "Soldier! About face!" Dad said it took a second for him to realize the command was for him. He turned around and there stood the colonel. When Dad looked at him, the guy said, "Soldier, don't you know it's customary to salute an officer when you see one?" Dad said he about died. He immediately saluted the colonel and said, "Yes Sir! Sorry Sir! My mind was not here Sir!". The colonel asked him where his mind was that he wasn't paying attention to business. Dad said, "Sir! I just received word that my brother-in-law was killed in a plane crash in Italy." The Colonel saluted Dad back and started walking off. Dad turned around to leave and about that time he heard "Soldier!" He turned around thinking "Now what does he want?" The colonel was standing there and he said, "Soldier, I'm sorry!"! Both saluted each other and went their way. It never gets old or boring reading my family history. Although Uncle Roy died before I was ever born, I feel like I knew him in many ways. Pride wells up inside me every time I see his picture and read of his service to our country. Can't wit to meet you Unle Roy! I love you! !